Like the TARDIS, Wellfleet seems bigger on the inside. The array of activities seems impossible for a town its size. Last night I saw that the array was not just in quantity, but in quality as well. 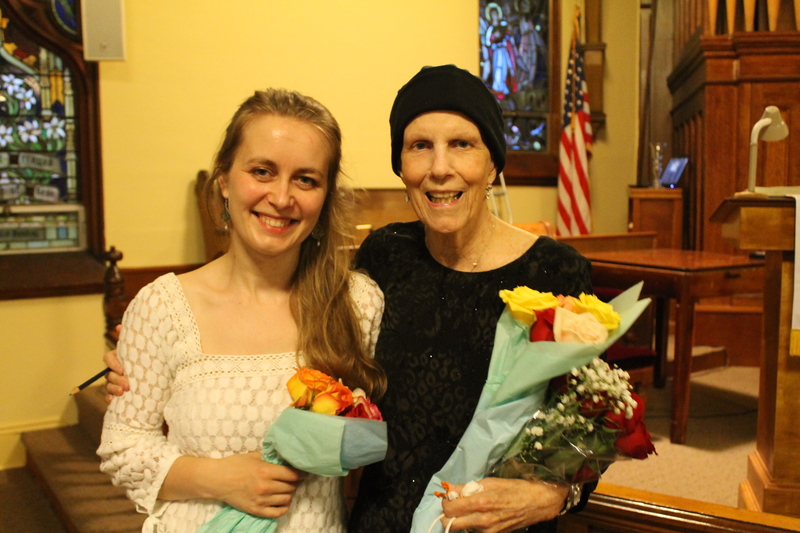 Monika Woods on clarinet and Deborah Geithner on piano offered a concert worthy of any featured event in a major city. The full house, the standing ovation, and the encore were testament to the beautiful music. It is easy to understand why Monika was the first prize winner at the Cape Cod Symphony Orchestra Soloist competition this year. You can listen to one of her performances here. 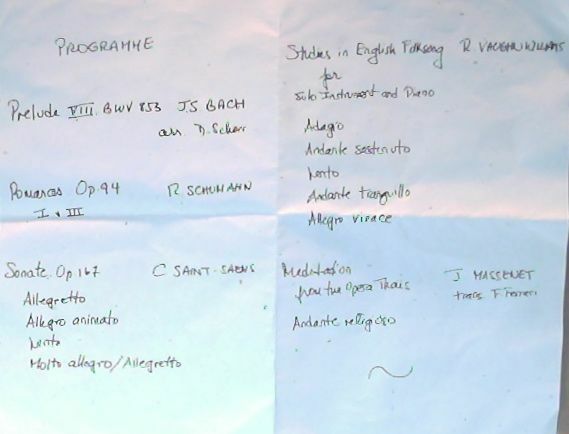 The programme yesterday evening featured Bach, Schumann, Saint-Saëns, Vaughn Williams, and Massenet. Every piece was a pleasure to hear, not something I’d say about many concerts. The feeling of a special event is enhanced by the fact that each attendee’s copy of the programme is individually penned, as is Deborah’s tradition. The Saint-Saëns Clarinet Sonate in E-flat major, Op. 167, which he composed in his 86th and last year of life, was a highlight that elicited wows and bravos. The Allegretto first movement was especially ethereal and welcomed when its theme returns in the fourth movement. The piece as a whole was captivating. The Sonate showed off the dialogue of clarinet and piano, as did Massenet’s Méditation from the opera Thaïs (Andante Religioso). That was another very moving selection. but it’s futile to make too much of any one piece, since every offering was excellent. It was no surprise that the audience would demand an encore. The reward was Este a székelyeknél (Evening in the Village), by Béla Bartók. It’s a simple, lyrical piece, with two contrasting themes, which balance beautifully. Drawing on elements from Transylvanian folk songs, Este a székelyeknél completed the evening’s theme of familiar, entrancing melodies, revealed by great composers and two great performers. 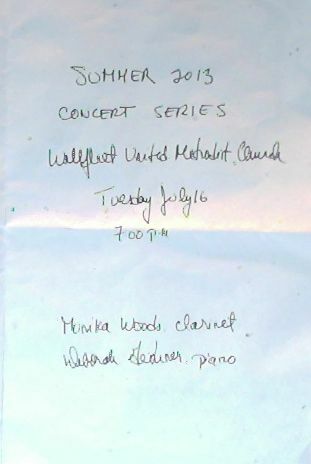 The concert was part of the Summer 2013 Concert Series at the Wellfleet United Methodist Church. This series has been a big plus for the community, drawing in people even while it’s still light enough for beach-going. 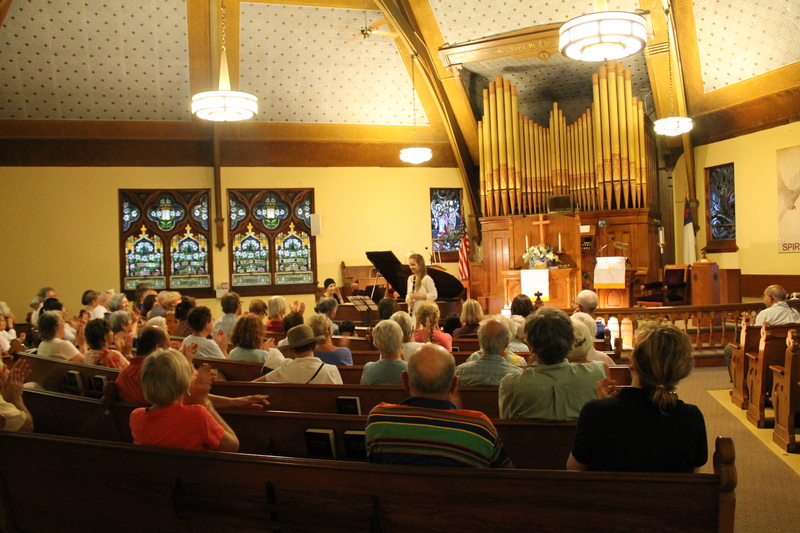 The sanctuary last night was filled with nearly 100 concert goers. This entry was posted in Cape Cod and tagged Cape Cod, community, culture, music. Bookmark the permalink.